Show your support for a teen's baptism. A teen baptism is a very personal and serious event in which a teen makes a personal commitment to and statement of their faith. A baptism gift shows that you accept and respect the teen’s decision, and you are there to support them. 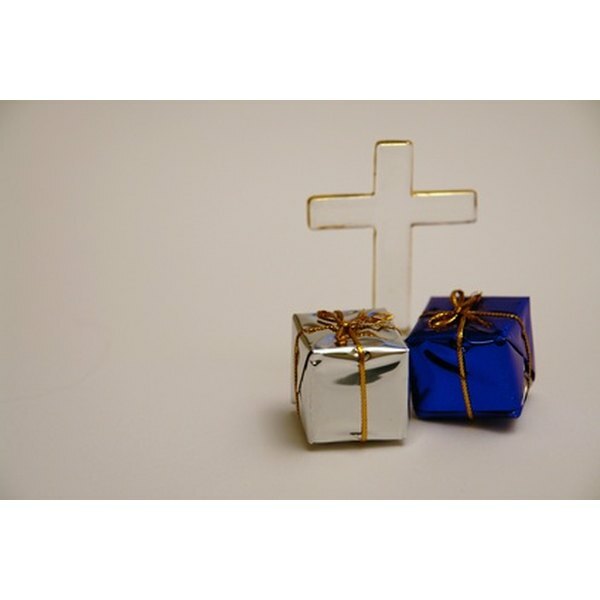 Baptismal gifts for teens often include items to help them grow in their faith. Necklaces or bracelets made of gold or silver that have a cross pendant are popular gifts to give a teen. More modern jewelry includes plates attached to necklace or bracelet chains and rings that can be engraved with the teen’s date of baptism and a Bible verse. Many teens might already have a Bible, but many don’t have a study Bible. Study Bibles for teens are available at most big bookstores and range in price. This type of Bible features timelines, maps of the regions depicted in the book, a concordance, and in-depth looks at topics surrounding faith and religion. For new Bible readers, consider purchasing a study Bible that has tabs in it. Often when a teen is baptized, they decide to get rid of some of their secular music. To help restock or add to their music library, give a teen faith-based music. If the teen isn’t familiar with Christian music artists, give them a compilation album that features popular singers and groups. Prayer beads can come in the form of a rosary or a round strand of special beads with a cross pendant in the middle. The prayer beads can help a teen focus when they are meditating on Scripture. Many faith-based books are available for teen audiences and are based on the topics of modern-day dilemmas, new-found faith, a teen’s future, dating and an assortment of theological topics. These types of books can also provide inspiration and tips to encourage a faith-filled life. Different than a diary, a prayer journal is a place where a teen can talk to God on paper. This is perfect for the teen trying out new forms of meditation, are learning how to pray or want to be able to focus better during this act. Some prayer journals include writing prompts for teens who might need a little help starting the writing process. Many baptized teens are part of a youth group that meets weekly. These teen groups often have weekend retreats, a week or two at a summer camp or a mission trip to help out other communities. These fun trips often cost money that a teen may not have. Sponsoring events like these is a good way to show your support for the teen’s faith. BlogHer: "Ten Gift Ideas for Spiritual Folks"
Christian Parent: "Gift Ideas for Teen Girls"
What Is a Nice Gift for an 8-Year-Old Girl That Is Being Baptized?